Born in Paris in 1865, Gustave Loiseau spent a brief period at the École des Beaux-Arts, but his true masters were clearly the Impressionist painters. From 1889, Loiseau went several times to Pont-Aven where, like his friend Maxime Maufra, he had met Gauguin. The latter had then given him one of his own still-lifes, Flowers, Blue Iris, Orange and Lemon (Boston, MA, Museum of Fine Arts), in memory of their meeting. 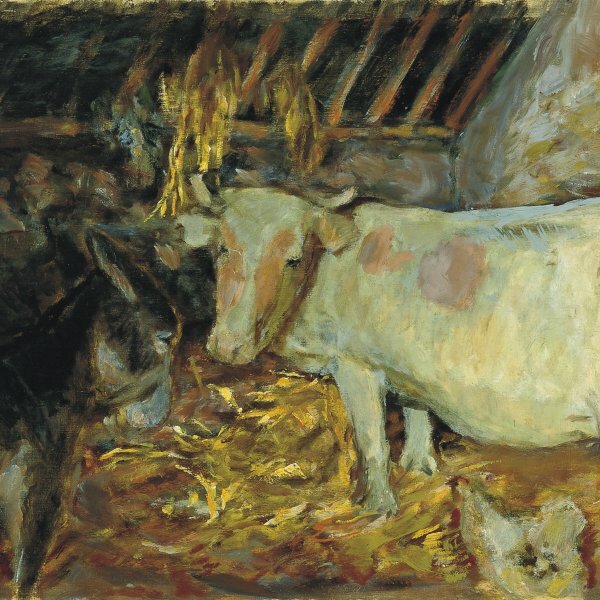 However, the artist did not show in his paintings a great interest in synthetism; rather, his works revealed him to be much closer to traditional Impressionism. 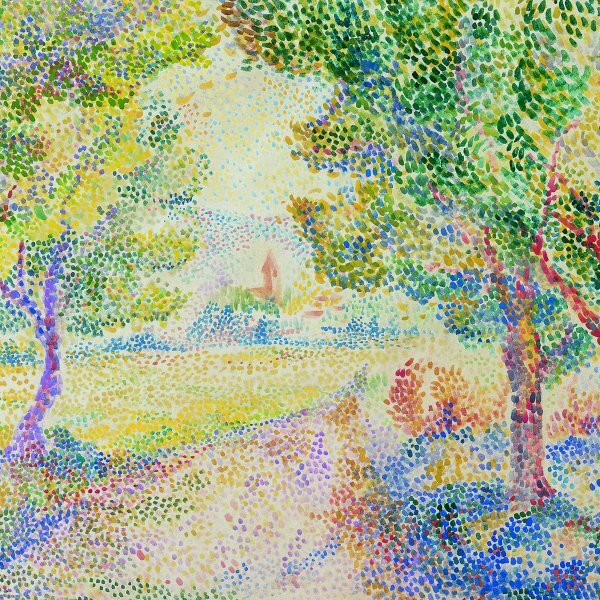 Gustave Loiseau painted the places represented also by Monet, Pissarro and Sisley. He enjoyed depicting the landscapes of the Île-de-France like Pontoise, or the banks of the Seine and the Oise, the Norman cliffs, as well as views of Paris. 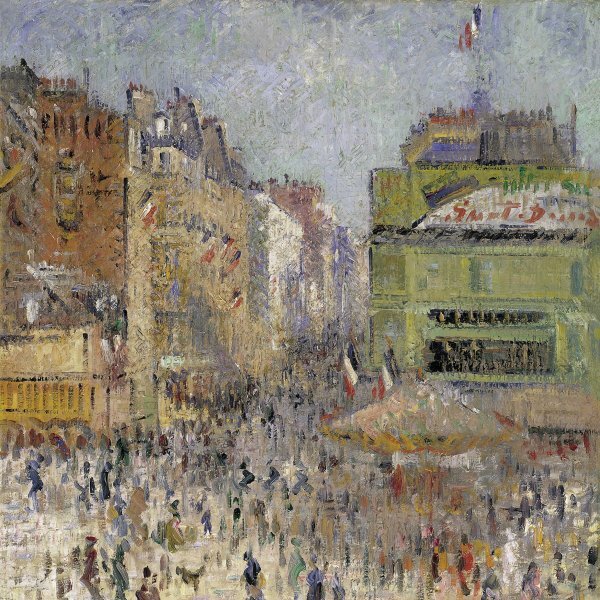 The Durand-Ruel Gallery supported Gustave Loiseau from 1897 and, just like Maufra, he belonged entirely to the second generation of the Impressionist painters. 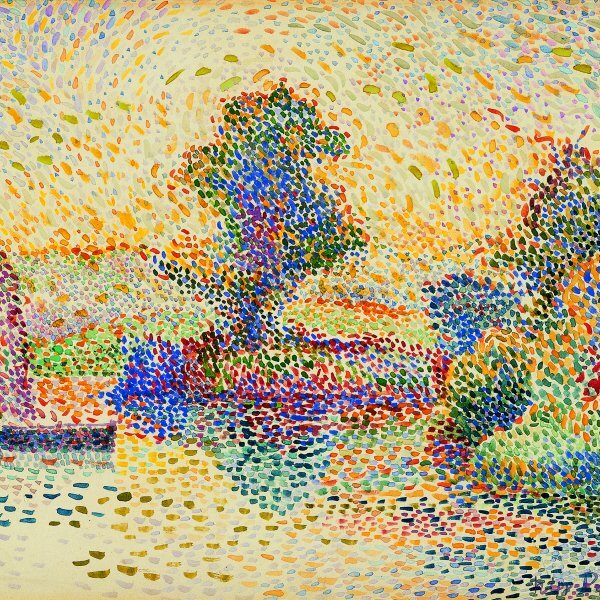 In fact, Loiseau showed a indisputable talent in his description of light effects full of delicacy, and had a predilection for misty, frosty or snowy atmospheres, and those subtle interpretations set him apart from his post-impressionist and fauvist contemporaries, who were fascinated by the contrast of pure and strong colours. When Loiseau painted View of Notre Dame in 1911, he was living in the quai Saint-Michel, and this painting was very probably executed from the building in the corner of quai Saint-Michel and the place du Petit Pont, where the Notre-Dame Hotel now stands. The bridge we see in the distance indicates that the artist positioned himself on the left bank of the Seine, and that he chose a slightly raised viewpoint. He was Parisian by birth, and spent his childhood on the Île Saint Louis: he was therefore very familiar with the area around Notre-Dame. The comparison between its present appearance and that of the painting shows a very attentive observation of the place as it was at the time. In the foreground, in line with the right-hand border of the façade, we can still recognise, on its stone pedestal, the bronze monument dedicated to Charlemagne built by Charles and Louis Rochet in 1882. The five plane trees aligned to the right of the monument, and the two young chestnut trees have grown to the point that they completely hide the garden and the buildings adjoining the cathedral on the right. The only real change is the widening of the cathedral square to the detriment of the green areas, the limits of which have been pushed beyond the monument to Charlemagne. On the side of the Seine, the garden has also been shortened following work carried out on the verges, and is now reduced to a thin strip of earth. This painting recalls the works depicting the same view executed by Luce, Matisse and Marquet at the turn of the century. 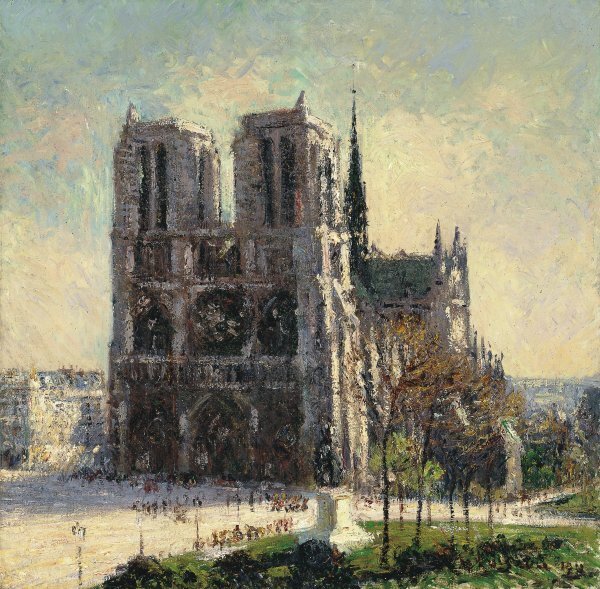 But it brings to mind in particular the remarkable series representing Rouen Cathedral painted by Monet in 1893. Contrary to the fragmentary and close-up views adopted by Monet in Rouen, Loiseau chose a more distanced viewpoint and gives us a view of the whole monument. Thus, the composition appears to be much more traditional, in spite of the unusual format of the canvas-almost square-which reflects the proportions of the church façade. The composition, with its predominant horizontal and vertical lines, emphasises the cathedral's volume, and at the same time provokes strong contrasts of light and shade. Following the example of Monet, the artist uses here a thick, rough, almost impasto texture, which expresses the solidity and the weight of the walls. As indicated by the reddish foliage of the plane trees in the foreground and the golden light which bathes the whole scene, the painting was executed in autumn.